info/tool boxes provides storage space for one’s ‘tools’ – for example one’s projects, drawing/writing/sewing tools, etc. Line Depping created ‘Tool Boxes’ in an effort to explore how we store things. 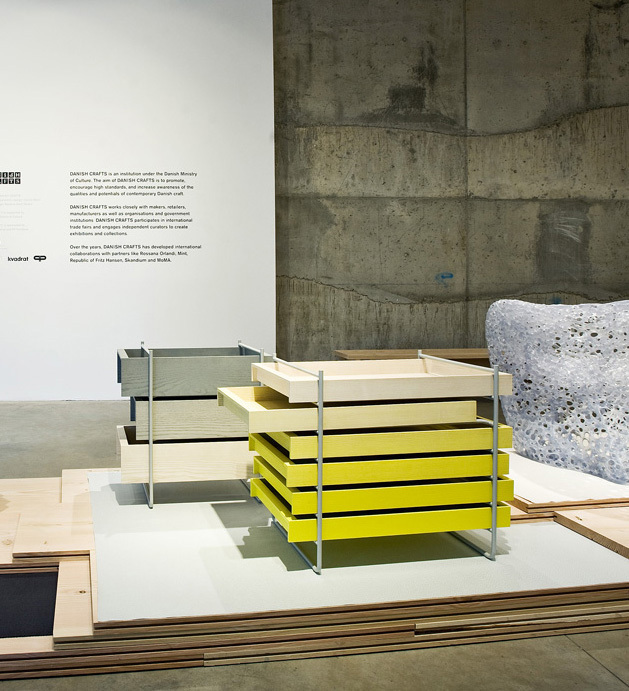 Her goal is to challenge the common perception of a chest-of-drawers and to reveal the drawers openly to the beholder. In ‘Tool Boxes’ she provides a rack for the boxes to make it easy to pull them out even when they are ‘stacked’ with other boxes. Each of the solid wooden boxes is designed as an independent tray that can be pulled out to either side or pulled out completely and placed on top. The top drawer is open and also forms the top of the piece. Thus, instead of concealing the contents, they lay it bare for all to see, and the functional quality is obvious.